PT Bank Negara Indonesia (Persero) Tbk - BNI (IDX:BBNI) or referred to as "Bank BNI" a leading state-owned financial services company in Indonesia with core business focus on general banking industry. 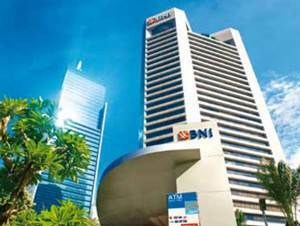 Based in Jakarta, Bank BNI provides a wide range of banking services; personal banking, priority banking, business banking, international banking and treasury. As a state-owned company, PT Bank Negara Indonesia (Persero) Tbk is controlled by the Government of Indonesia Indonesia. To date, PT Bank Negara Indonesia (Persero) Tbk is 60% owned by the Government of Indonesia and 40% by public. As of December 2016, Bank BNI's operations are divided into 17 regions. These regions gave the bank a total of 196 branch offices, 948 sub branch offices, 623 cash offices, 96 mobile services, 17,056 ATMs spread across Indonesia. Bank BNI also supported by 8 overseas offices; BNI Singapore, BNI Hong Kong, BNI Tokyo, BNI Osaka, BNI London, BNI New York, BNI Seoul and BNI Yangoon. Bank BNI's performance in 2016 improved over the previous year. According to PT Bank Negara Indonesia (Persero) Tbk Annual Report 2016 as cited by JobsCDC.com, Bank BNI maintains total assets of Rp 603,032 billion in 2016. This number is up 18.56% from Rp 508,595 billion in 2015. As of the end of December 2016, Bank BNI booked a total operating income of Rp 41,229 billion, marking an increase of 16.93% over theRp 35,258 billion of the previous year. As of December 2016, Bank BNI controls total customer deposit of Rp 435.5 trillion and maintains total loans worth of Rp 393.3 trillionn. Minimum height of 165 cm for Male. Minimum height of 155 cm for Female. Minimum education SMA or equivalent up to Bachelor Degree (S1). Minimum average report score of 7.00 in 5th and 6th semester for SMA or equivalent. Minimum GPA of 2.50 (for D1 up to S1). Not married and willing to not get married during the internship period. Fresh graduate and do not have any work experience. Not involved in drugs or violations of law as evidenced by SKCK. JobsCDC.com now available on android device. Download now on Google Play here. Please be aware of recruitment fraud. The entire stage of this selection process is free of charge. 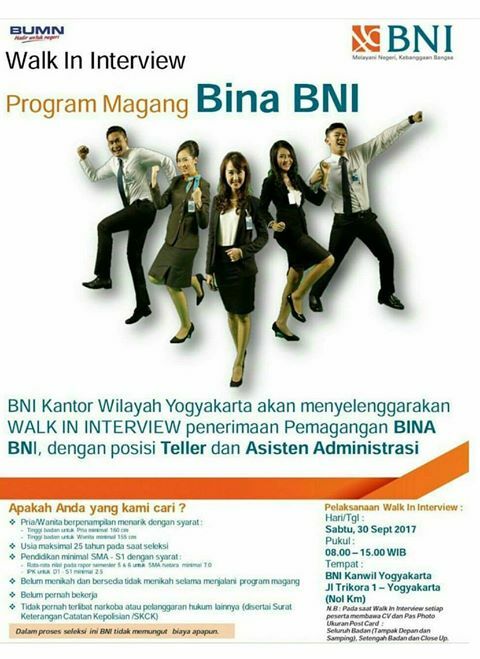 PT Bank Negara Indonesia (Persero) Tbk - Walk in Interview BINA BNI Program BNI September 2017 will never ask for fees or upfront payments for any purposes during the recruitment process such as transportation and accommodation.